Mayon volcano is a beautifully symmetrical volcano in the northern Philippines. It has been frequently active during historical times. Mayon is a stratovolcano in the Bicol arc of Luzon island. It is a subduction-zone volcano, forming above the subducting Philippine Sea Plate, which is sliding westwards, beneath the Philippines and the Sunda plate. How does Mayon stack up as a Top Trumps Volcano? The scores on the cards are based on what we know about the past and continuing activity of Mayon. Explosivity (Volcanic Explosivity Index) – 4. Mayon has frequent, moderately explosive eruptions, and is the most active volcano in the Philippines. In recent years activity has included the eruption of lava flows, and explosions from the summit crater at the top of the volcano. Height – 2462 m. Mayon forms an imposing sight on the Bicol landscape of Luzon island. Deadliness. 129. 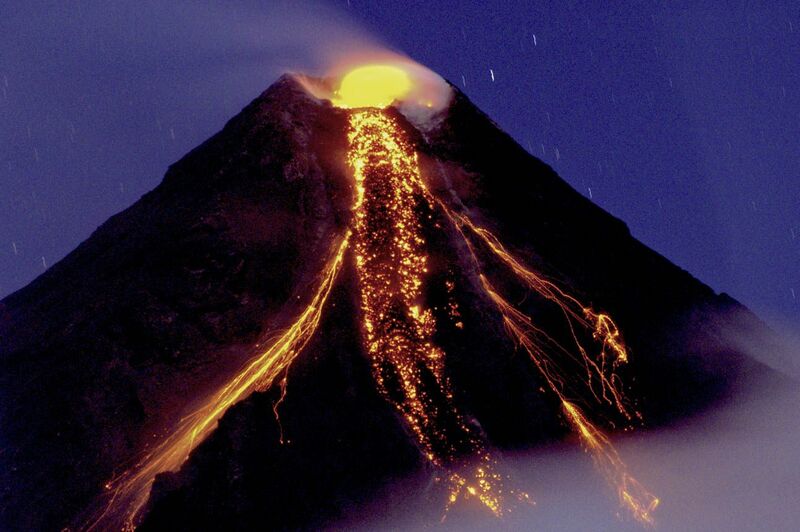 The eruptions of Mayon are usually relatively small, but there is a significant hazard from lahars, as the freshly deposited ash and rubble is rapidly washed downstream in rainy-season floods, and there have been very damaging explosive eruptions in the past. In 1814, a major eruption buried the nearby town of Cagsawa under lahar and pyroclastic flow deposits. Wow factor – 93. Mayon is a classically conical volcano, which stands proud from the countryside around. Unpredictability – 26. Mayon has a long history of small to moderate eruptions, so this score is relatively low. Devastation Potential – 528. This is a very dangerous volcano, prone to destructive lahars (volcanic mudflows), and pyroclastic flows. Mayon is closely monitored by the Philippine Institute for Volcanology and Seismology (PHIVOLCS). There are some up to date pages on Mayon volcano on VolcanoDiscovery.